The 2011 convoy of Belgians to Zurich was conducted en voiture, as opposed to last year’s Great Train Journey. This year’s odyssey had two immediate results. 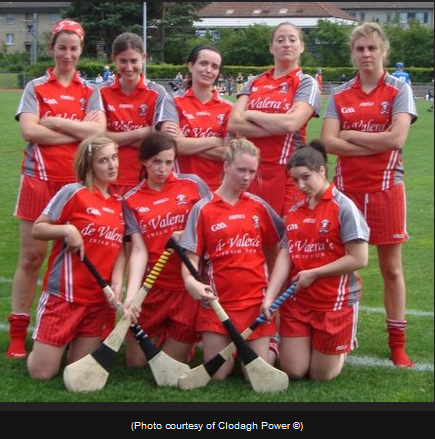 Firstly the camogiers (pictured below) won their third tournament of the year and in doing so, retained the European Championship ahead of their home and final tournament in Leuven in July. The second result was the following article by Shane Ryan, Hurling Officer, on the subject of the Hurlers’ Day Out. There was an uncanny sense of déjà vu walking off the immaculate field in Zurich on Saturday. Another sluggish start, another gallant defeat, another missed opportunity. This, however, was far from a wasted 16 hour round trip. There were great performances from each and every Belgium player and we go into the Belgium home tournament with a real sense that we can win end the season on a high. Willie saw Machiavellian dealings at play when Belgium were drawn to play the first game at 9 o’clock. He responded well though and channelled his frustrations into a great performance in the back line all day. Unfortunately, the over-all team performance left a lot to be desired in the first half of the Zurich game. Miss-hit frees, wayward hand passes and wild pulls characterised a first half where we went into the half-time break having failed to register a score. Things improved in the second half. Conchur de Barra bullied the pantomime villain of the hour, holding him scoreless from play. Despite commendable performances from the returning Aonghus O’Muircheartaigh and Adrian Hiel, Belgium conceded too many long range points. Zurich players were content to shoot from far out and, unfortunately for us, they had the radar working. A game that fizzed and bubbled at times was ultimately unsatisfying as Zurich ran out easy winners in the end. “There’s no need for sun cream today, sure it’s too cloudy” said a soon-to-be deep-fried Darragh Cotter to lobster impressionist extraordinaire Conor Aylward. The mercury was rising throughout the morning and our two hour break before playing The Hague garnered mixed feelings. As it turns out, it seems to have given us time to wake up (and play a little Frisbee). Our passionate and slightly hobbled captain, Phil Cushen, reminded us before the game that it was “do or die” and so it proved. This game saw every player standing up to be counted. Darragh Cotter and Kevin Keary dominated. Darragh was majestic in the air while Kevin played his man from the front and won every ball that came his way. The frees started going over and there was a real feeling at half-time that this game was there to be won. Conchur, in midfield, was marking a man who eventually won “the player of the tournament” – I didn’t see this prize but I can’t help but wonder whether it would also fit in Conchur’s pocket, a place its owner is well accustomed to. Fergal Mythen was his usual brilliant self, driving on the rest of us and surging up the field. With five minutes to go we were seven points down. Two lobbed in frees resulting in well taken goals were dissected by an exchange of long range points. We were one point down with one minute to go. The point wouldn’t come however. The “referee” blew the whistle and the game ended in an arguably undeserved victory for The Hague. Unable to make the final, we went out unrestricted by pressure in the final two games and played with reckless abandon in finishing 3rd. We shot from wild angles, played cross-field balls and ruthlessly soloed for goals when points were on. Everything worked. Ciaran Kelly will probably remember these games as the time when we realised he was actually a back. He plucked high balls out of the sky, cleared ball into the forwards and generally put down a marker for the next day. Denis O’Sullivan also showed he has taken all of Martin’s training on board, scoring two goals. Martin himself had a great day. Excellent puck outs and goal-tending were complemented by well taken points when he decided to stretch his legs in the full forward line. Conor Aylward, Darragh Cotter and Conchur de Barra all scored points (and goals) from long range. Overall it was enjoyable. We all want tough games and we are getting them. Last year we won the close ones, this year we have lost them. If it was a matter of luck, I’d say we have been unlucky with poor refereeing and bad decisions. Unfortunately, we can’t blame luck. We just need to work harder in training and drive on to Leuven. Speaking of driving, thanks to Kevin, Phil and all the lads who drove down to Zurich – it’s a testament to your dedication. Let’s get everyone to training now for the next month. 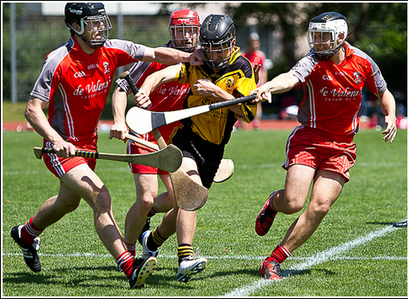 It’s summer-time, let’s play hurling.